2010 and 2012 Indy Monumental, 2010 Grand Rapids, 2013 Chicago, Akron every year! I love running and triathlon! I run for health, performance and social reasons. Running helps me stay focused and clear my head. I enjoy the challenge of training and racing. It’s rewarding to run a PR, place overall or age group at races. I have met so many great people and friends because of running and triathlon. I really enjoy pacing! It is very rewarding to motivate other runners, help them reach their personal goals and give advice and leadership. Pacers are mentors and coaches for other marathoners;helping people run a PR or BQ is very fulfilling. 2013 Chicago Marathon 3:00 Pace Team - We had a large group of solid runners and we paced very consistently. Chicago is epic and weather was great! A runner I was coaching caught us at 6 miles. Charles ran by my side to the finish, running his sub-3:00 in 2:58:51! His previous PR was 3:19. Amazing day for him and he was so thankful for my coaching/pacing to reach his 26.2 goal. Way to go Charles! You will receive excellent coaching, advice and leadership by running with my group. I will give motivation, energy and provide a fun group to run with. 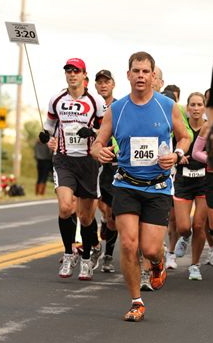 I will pace consistently for optimal marathon performance to help you reach your goals. My advice for all marathoners.....trust your training, relax, and enjoy race day and the marathon experience. You will be pleasantly surprised.